ThinkFun is a company that excels at creating logical deduction puzzles for solvers of all ages. Whether it’s moving robots toward a rocket ship in Lunar Landing, completing electrical circuits in Circuit Maze, or placing mirrors to reflect a laser’s beam in Laser Maze Jr., these clever puzzly challenges introduce classic puzzle concepts to younger solvers in engaging, unique ways. 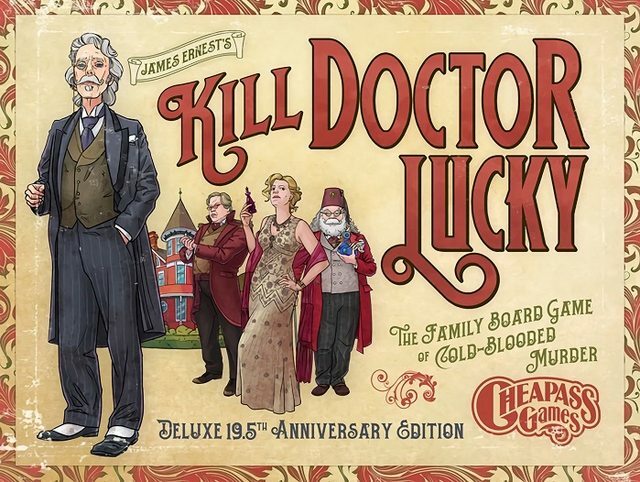 But with their latest release, they’ve taken a step back from more high-concept, high-tech puzzles and embraced a more traditional logic puzzle format. In Cat Crimes, you’re given a series of clues, and it’s up to you to place the six cat characters around the living room in order to determine which one has been up to some destructive mischief. 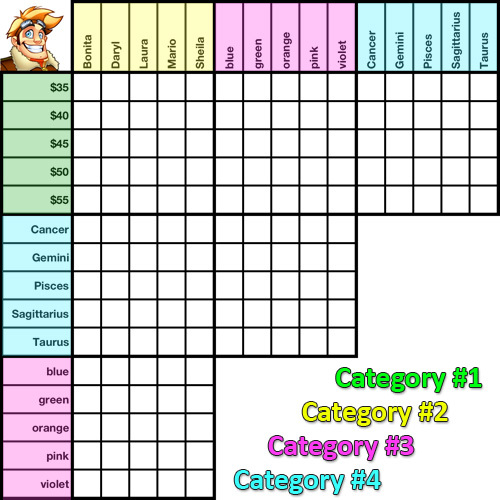 For instance, a given challenge card will list the crime in the upper right corner — a flowerpot that’s been knocked over, for instance — and the clues listed beneath will tell you which cats are your suspects, along with hints for where to place them in the living room. The living room is covered with little bits of visual evidence — scratches on the floor, paw prints, mouse toys, etc. — that can be used to help you figure out where each of the cats were sitting when the crime was committed. The beginner-level mysteries start out simple, with the clues mostly focused on the placement of the cats (across from a sock or next to some catnip, for instance). As the mysteries cards grow more complex — moving from beginner and intermediate levels of difficulty to advanced and, finally, expert — more options emerge. A cat could be in one of two places, or is only referenced with regards to another cat it’s sitting next to or across from. 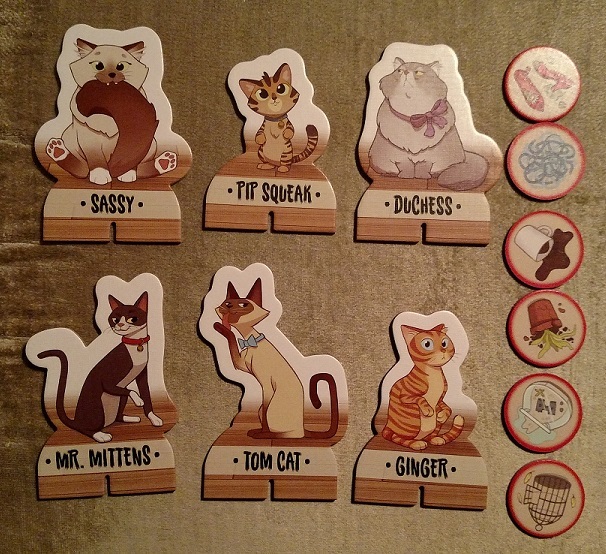 Higher-level challenge cards will also refer to qualities of the cat suspects themselves. Some wear bows or have bells on their collars, while others are referenced by eye color. Solvers need to keep increasingly greater amounts of information in their head in order to place all of the cats in their proper positions and solve the crime. With only six possible crimes and six possible suspects, you’d think that repeated play would lead to player burnout or quickly exhausting the possible permutations, but that’s not the case here at all. As you ascend through the deck of challenge cards, the ThinkFun team throw new twists and cluing styles at you, keeping you on your toes. A lot of creativity and hard work went into the cluing here, and it shows. It’s not only an absolutely adorable way to bring logic puzzle solving to a new audience, it’s also a refreshing change of pace for solvers accustomed to traditional logic puzzles (complete with those tables where all of the possible permutations are listed, and you can simply cross off the incorrect ones as you go). Cat Crimes requires you to keep more of that information in mind as you determine where each cat goes. 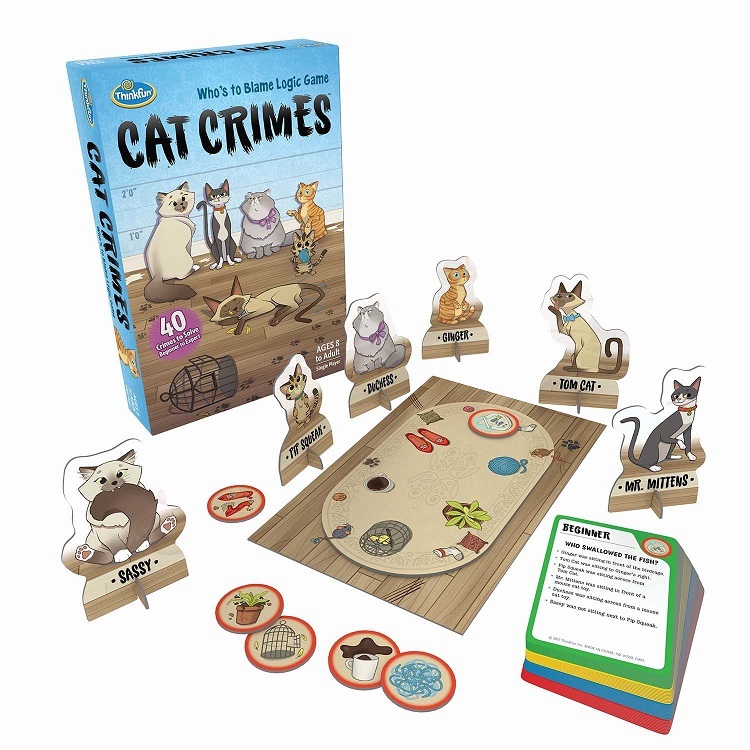 With up to six feline suspects to place per crime and 40 different crimes to solve, Cat Crimes will keep your deductive skills sharp, even as the easier challenge cards introduce younger solvers and logic newbies alike to a different style of puzzle-solving. 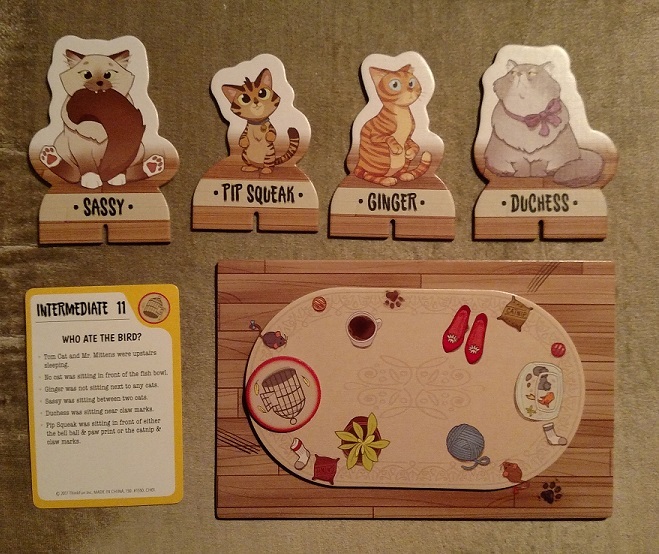 Cat Crimes is not just one of the cutest puzzle games I’ve played in a long time, it’s the perfect gateway puzzle to strip away some of the intimidation factor of logic problems.